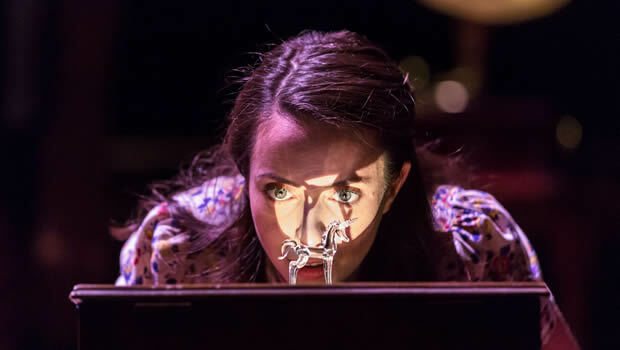 When John Tiffany's production of The Glass Menagerie opened on Broadway in 2013, it was revered amongst the critics. Now, the revival has arguably more sway, not least because of Tiffany's success with Harry Potter and the Cursed Child, which has subconsciously raised our expectations. It's one of Tennessee Williams' better known plays, which means an abundance of flowery language and wistful pauses. Tom Wingfield, played by the wondrously erratic Michael Esper, narrates from the start, drawing us into his “memory play” with talk of magic and illusions. He recalls his mother and sister, and the pining for “gentleman callers” as well as his own confused troubles. There's a lot of magic and illusion in the show, with several choreographed motifs from Steven Hoggett. “In memory, everything seems to happen to music”, says Tom, and he is right, as Nico Muhly's melodies frequently fill the air. Usually, music in plays can be a burden, but here the tunes simply seek to add to the hazy, dreamlike state. Amanda Wingfield is determined to receive gentleman callers for her daughter Laura, although really it seems that she's keen for herself to be entertained. Cherry Jones returns to the role, making it clear why received so much acclaim. Switching from an uptight nag to a charming dreamer, she is everything frustrating and caring that a mother should be. Kate O'Flynn excels as Laura, the “crippled” daughter who longs to disappear. She is sweet and polite, but there's a haunted, vacant expression that takes over her face when she sits, almost unnoticeable, on the gaudy orange sofa. It's mesmerising. Brian J. Smith reprises his role as Jim, the gentleman caller who more than oversteps his mark, but is never pushy or insincere. Here, Smith finds a softness to the role that wipes away any potential thoughts of manipulation or meanness. It's Michael Esper who carries the show though, bubbling with a nervous energy that has him visibly twitching from foot to foot. The story takes place within Bob Crowley's intriguing set; a large black space spans the stage, with four or five simple pieces of furniture. A metal staircase winds way up into the rafters. It seems odd at first, a little too bare, too blank, but as the play goes on the endless stretch of black is an endless void that continues on and on, leaving this family in a strange limbo. This is a stark look at the fragility of one family who are a menagerie; a zoo of people who simply don't fit together. “How beautiful it is and how easily it can be broken”. Tiffany's production proves that Williams’ play is, indeed, beautiful, and in this case the production puts the audience under a spell that simply cannot be broken.